As in 2016, the third running of this free seaside airshow in 2017, was conditional on being awarded displays by the RAF. Displays by the Red Arrows and the Typhoon were awarded and so the airshow did go ahead. Other displays included the Wildcats, Terry Martin's Westland Wasp, the Kent Spitfire and Hurricane, Strikemaster and the Aerosparx Twilight Display. It was hoped that the Sea Vixen would also display, but 'Foxy Lady' was damaged during a wheels-up landing on return from a display at Duxford and is not expected to return to flight before 2019. On the ground, attractions included static aircraft, the 'Trench' experience with a converted 40ft container featuring the sights and sounds of a Great War trench, live music and the usual trade stalls on the lawns either side of the bandstand and on the sea side of Central Parade. New to the airshow circuit in 2015, a repeat of this free seaside airshow in 2016 was conditional on being awarded a display by the Red Arrows. The Red Arrows did confirm and so the show did go on. 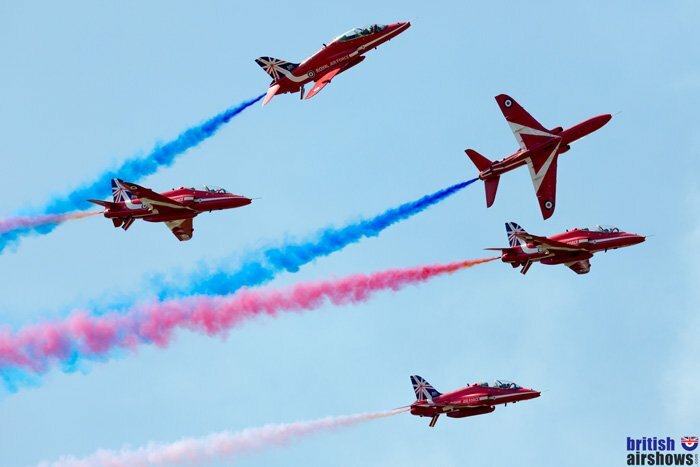 Not only did the RAF confirm The Red Arrows, they also allocated the Eurofighter Typhoon and the BBMF trio including the iconic Lancaster, which had missed so many shows in 2015 and earlier in 2016 because of a series of technical problems. The show may be remembered by many for the incident in which DRUINE D.31 Turbulent G-ARNZ ditched in the sea, flipped over and was righted by spectators, thankfully, without serious damage or injury. A less-reported incident was the failure of the parachute of Tigers Parachute Display Team member LCpl Chris Smith who came in on his reserve 'chute just seconds after the landing of the tandem pair of Cpl Frank Millerick and LCpl Jake Manwaring who had dropped as a tandem pair, one upright and one inverted. The line-up at Herne Bay was very impressive. It may be generally regarded as a smaller, young show, yet it is already able to compete in many respects with the longer-standing and better known seaside shows at Eastbourne and Bournemouth. The WW2 survivor, Hangar 11's Mustang was an early booking. This Mustang had been flying as Jumpin' Jacques but for 2016 was repainted to represent the role that it actually flew towards the end of the war, when it was part of the American 332nd Fighter Group known as "The Tuskegee Airmen", referred to as "The Red Tails". Also due to fly were three vintage jets: Norwegian Air Force Historical Squadron's Vampire pair and the Sea Vixen. Unfortunately these three had to cancel. The Sea Vixen had developed a problem with one of the flaps just before a display earlier in the day at Eastbourne and had returned to base at Yeovilton. 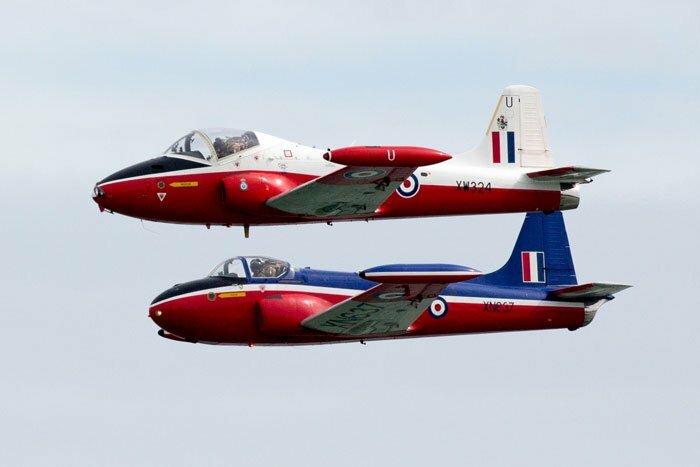 Nevertheless, vintage jets were still well represented and included the Jet Provost pair of Dan Arlett in T.5A XW324 and Ollie Suckling in Jet Provost T.3 XN637. Dan and Ollie are both members of the JP Display Team but this was the first year they displayed as a duo: their pairs debut was just a few days earlier at Eastbourne's Airbourne. Mark Petrie's BAC Strikemaster, in its grey Oman livery, the Gnat Display Team and the MiG-15 brought up to six the number of vintage jets - a rare achievement for an airshow in the post-Shoreham era. The other displays are listed in the table and will not be recited here but it is worth noting that rotaries in the form of the Westland Wasp, vintage and modern jets, light aerobatics, family fun displays such as the Wingwalkers and the Turbulent Team and warbirds were all well represented. The organisers deserve huge credit for bringing such a variety of displays to a show that may be relatively small in size but is big and becoming even greater in reputation. There is very little parking in Herne Bay. You are recommended to use the good public transport links. You could also drive to a nearby bigger town, such as Margate, and use public transport from there. If you do drive, use sat nav CT6 5LU until you get close, but ignore the sat nav in favour of local directions signs as soon as you see them. There are links to route planners in the Travel Advice column if you prefer to plan ahead or don't have sat nav. National Express coach service number 22 links London, Canterbury, Herne Bay, Margate and Ramsgate. The bus depot is very close to the flying line. Local services are provided by StageCoach South East. You can use their web site to plan a local journey. Herne Bay has its own station. The station is about a ten minute walk from the centre of the flying line. Click the blue Expedia name for a list of hotels and guest houses near the show. The venue is already built into the link but when the list comes up you do have to enter your dates and adjust the number of rooms and guests, if necessary. The International Hotels Group have a Holiday Inn Express in Minster, about ten miles away to the east (near Manston airport). There is a Premier Inn hotel in Herne Bay.